Trying to Lose Weight? Drink Water! All functions within the body require the presence of water. A well hydrated body enables these functions to occur quickly and efficiently. Researchers carefully monitored water intake, diet, physical activity, weight, percent body fat, and waist circumference on a group of women involved in a year-long weight-loss program. They found that drinking more water was associated with a significant loss of weight and body fat over the year. Just how water results in benefits for weight loss is not fully understood. However, it appears to have an independent benefit in weight loss as well as encouraging healthier eating habits, such as drinking water in place of soft drinks and other high-calorie beverages. Water also has benefits kidney and bladder health, temperature regulation in hot climates, and a healthy circulation. Drinking water may also help suppress appetite and calorie intake. Water makes your metabolism burn calories 3% faster. Drinking water is important if you're trying to lose weight, some studies have shown that thirst and hunger sensations are triggered together. If there is a slight dehydration the thirst mechanism may be mistaken for hunger and one may eat when the body is actually craving fluid. As most food contains some water, if one doesn't drink much they may be subconsciously driven to eat more to gain the necessary water supply however, you also gain the undesired effects of increased calorie consumption. 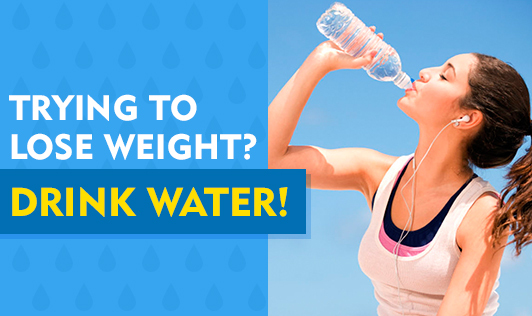 Drinking more water can help to prevent overeating and benefit weight loss. All of these reasons add credibility to the idea that drinking water frequently throughout the day and staying well-hydrated may help in long-term weight loss and weight management.